Do you ever feel like your subconscious is leaking out? I was researching decorations for my dear friend’s wedding when I got kind of stuck on sticks. 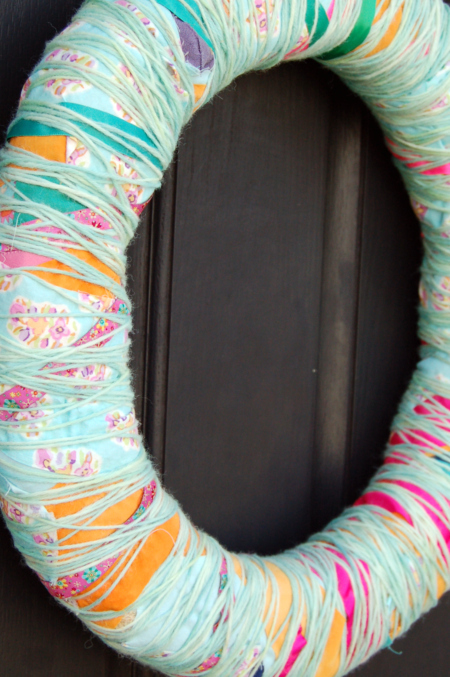 Here’s my pinterest page on stick decorating. 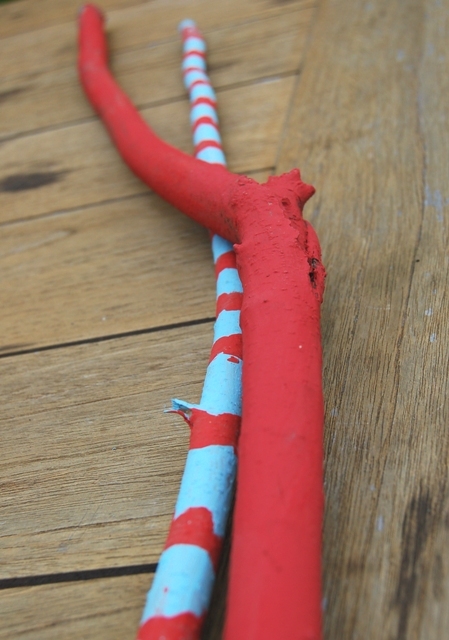 My kids never saw any of this, but somehow, they seemed to know about it, because later that day, after hubs had trimmed some bushes, they hunted down the paint and began decorating these sticks. I’m loving the Dr. Seuss vibe. I also chopped (with the trimmer) a bunch of sticks into shorter segments for us to make into a new winter wreath. Our old one is kind of sad and decrepit. I’m alllllllmost finished with a dress I’m making. Just three more buttons! I can’t believe I actually made 9 successful buttonholes. This is a new milestone. Meanwhile, I hope a certain little ninja will appreciate his costume that’s nearly finished. Who am I kidding? Kids have no idea the work that goes into costume-making. That’s okay. I’ve had fun making it, and I’ve kept it really low-key. I may make a little tutorial about the tunic part of it. I’m still plugging away at my writing projects. Trying to keep my nose to the grindstone. And made Foster’s Market Jamaican black bean soup last night. Also put up some pesto. Yum! I love looking at craft books almost as much (okay, sometimes more) than crafting. 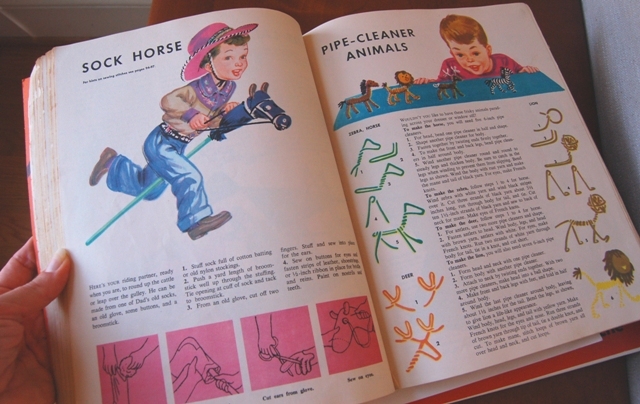 In my house growing up, my mom and I always called these “make it/ do it” books, after two of our favorites, her own McCall’s Giant Make It Book (1953) and my Great Big Golden Make It & Do It Book (1980). Many happy hours were spent poring over those pages. Most of the projects I never made or did, but just knowing that I could, imagining them, and looking over the pictures and instructions was (is) very satisfying. I still love make it/ do it books, and in the stack are a few more recent favorites. Made to Play by blogger Joel Henriques. This book, given to us by a good friend, inspired our cardboard factory last summer. The author’s blog is madebyjoel. 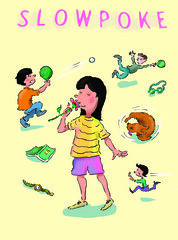 Sticks & Stones & Ice Cream Cones by Phyllis Fioratta is another childhood favorite. 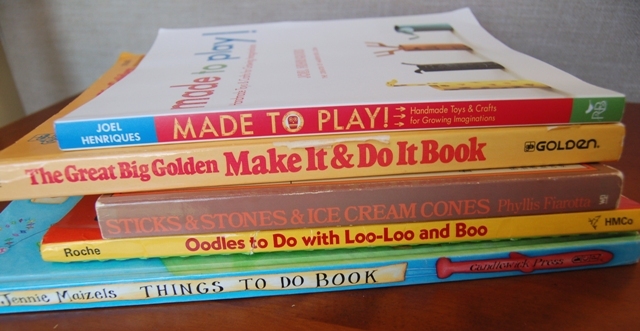 Oodles to Do with Loo-Loo and Boo by Denis Roche, a Vermont College friend of mine. This one has great illustrations and fun characters who guide you throughout as you make arts and crafts with easy-to-find and recyclable items. Things to Do Book by Jennie Maizels. I love, love this concept for a book. 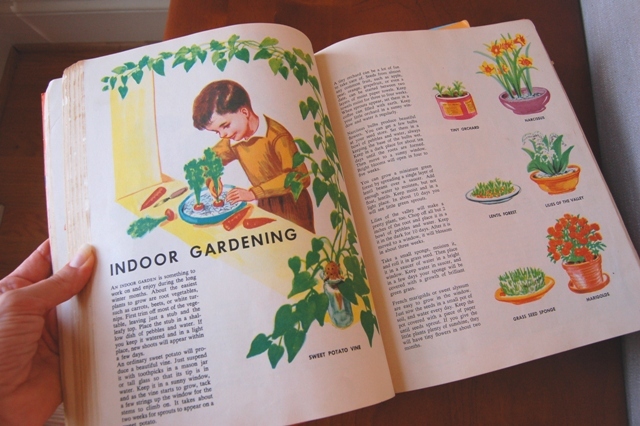 Each illustrated spread has a theme (“in the car,” “in the garden”) picturing various activities in a particular setting. There are little flaps to lift that are like secret treasures. In concept, it’s a little like a Richard Scarry book with activities to do instead of labels. Perfect for those “I don’t have anything to do!” moments. I also remember loving A Boat, A Bat, and A Beanie: Things to Make from Newspaper from the library back in the day. It shows you how to make great stuff (sandals! a wig!) out of, yes, newspaper. I think I need to order a copy of it. I love getting copies of old library books I used to check out over and over. Ach! 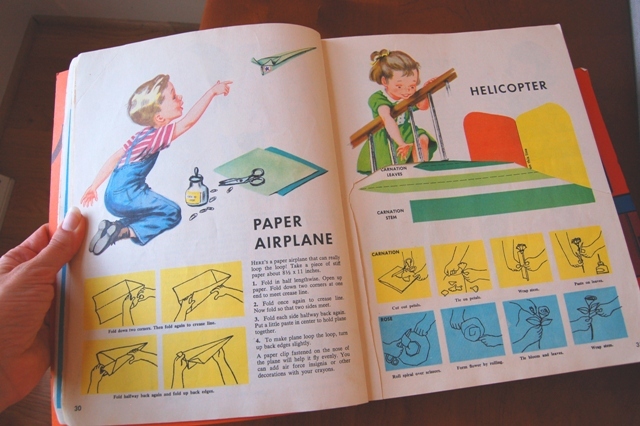 There’s just something about these glowing 50s illustrations that just gets me every time. Everything looks so fun! The clothes so quaint! I just want to jump into the pictures, like Mary Poppins’ chalk drawings. 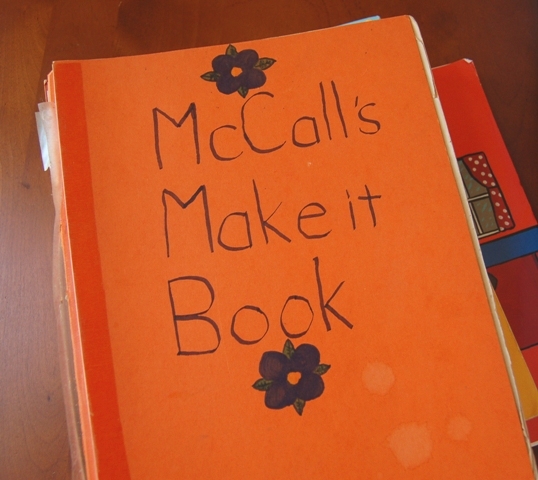 There’s a little video about the McCall’s book here. What about you? 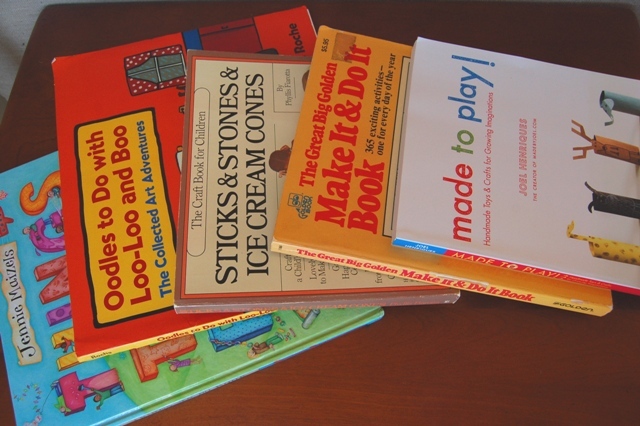 Do you have any favorite craft books of your own, or do your kids? I think craft books make great gifts. 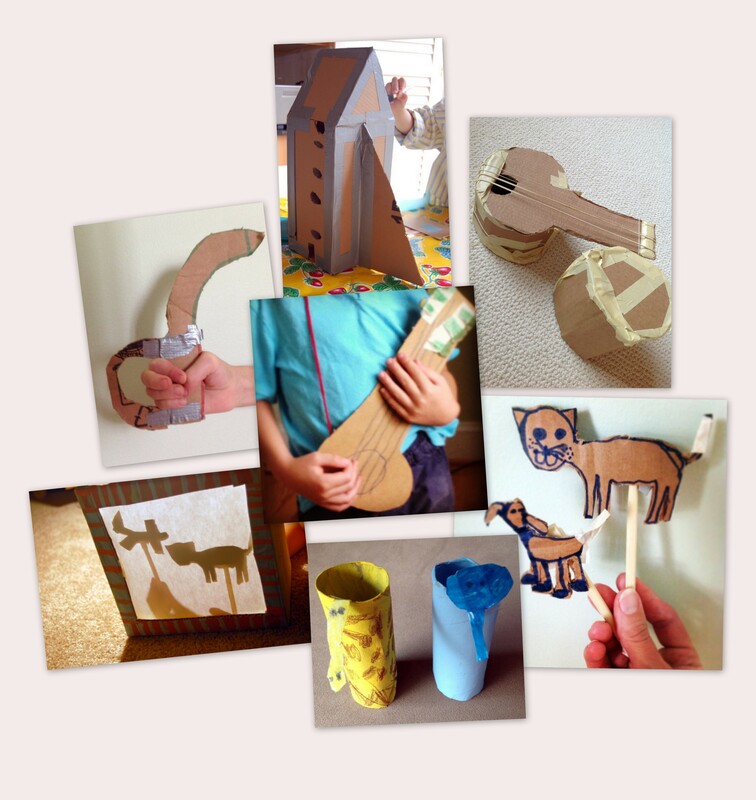 For more kid craft posts, click here. Hope you have a great weekend. I’m off to the Carolinas conference of the Society of Children’s Book Writers and Illustrators (SCBWI). Lucky for me, it’s right here in town. I’m not exactly sure where it started (maybe with the rocket? maybe with this book? ), but over the course of the summer, our dining room became piled high with cardboard creations. I thought I’d share a few, in case they might inspire you or your kids. The center photo is the first guitar my son made. The others, clockwise from the top: a rocket, guitar #2 and drum, shadow puppets, tube puppets, shadow puppet theater, and sword. Summer’s over, and the factory had to be cleaned up, but we make sure to have a small cardboard stash at all times for building material. 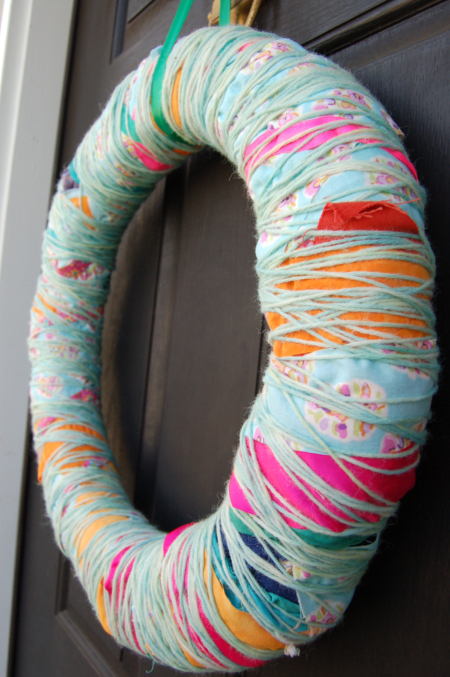 For more kid’s crafts, click here. 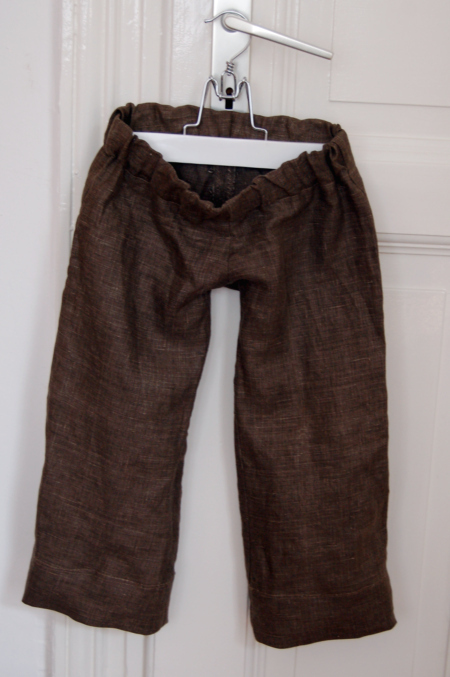 My little guy (4), who has seen me make lots of things for his older sister, asked if I’d make him some pants. I was touched, but I hesitated. “Pants are kind of hard,” I said. I mostly make really simple skirts for my daughter. “But you could do them like this,” he said, pointing to the elastic waist of the pair he had on. How he knows anything about garment construction is beyond me, but he had a point. Why not? I started them during Kid’s Clothing Week Challenge (when I made the hats and nightdress also). I think he even picked out the fabric, the same linen I made this dress from. I used this pattern, which is super simple and has very good instructions. I lengthened it a little (it’s a size 3 I think) and added a little width. I made a very wide hem so I can take them out again when he grows. I’m really happy with how the pants turned out. They look so comfortable I almost wish I had a matching pair for me. They would also be really easy to make as shorts. 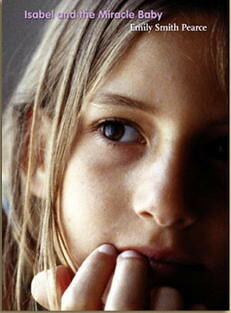 I just finished re-reading What Happened in Hamelin. It’s out of print now, but I’d read it as a kid and had to find it again since we are now living close to Hamelin. It’s a realistic retelling of what might have actually happened with the Pied Piper of Hamelin. Pretty dark and a bit scary, which I think is why I liked it in the first place. I was surprised at the images that had stuck in my mind for so many years—don’t want to spoil anything for you by hints, sorry. It’s definitely worth a read if you can get your hands on it. I donated my copy to the international school here.